Some people don’t realize that Pacific Avenue used to be lined with the railroad tracks of the Texas & Pacific Railway (hence the name “Pacific”). 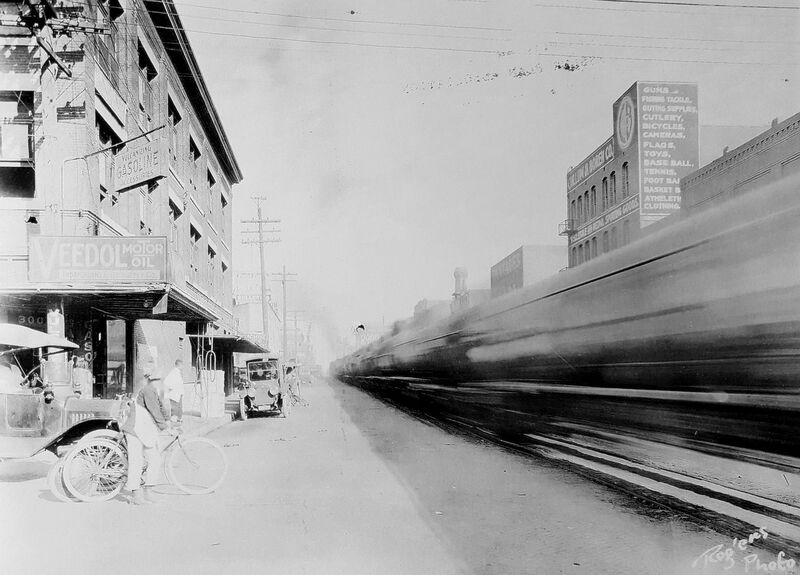 When trains weren’t barreling down Pacific regularly, the thoroughfare was used by non-locomotive traffic like pedestrians, bicycles, horses, and automobiles. When a huge cinder-spewing train screamed through, everything came to a resigned halt until it passed by. I can’t even imagine what that was like. I wonder how many times people, horses, vehicles, etc. didn’t manage to get out of the way in time? When Union Station opened in 1916, trains that had previously run through the central business district now went around it (which probably cut the number of people rushed to the hospital with train-related injuries substantially). But back to Pacific in its scary, sooty, T&P-right-of-way days. This is what things looked like in 1909. Thanks to the Kessler Plan, those unsightly tracks were finally removed from Pacific in 1923. Below, a photo from 1925. Big difference. Thanks, George Kessler! Top photo (by Frank Rogers) from the book The Park Cities, A Photohistory by Diane Galloway (Dallas: Diane Galloway, 1989). The photo is credited to John Stull/R. L. Goodson, Jr., Inc./Consulting Engineers. 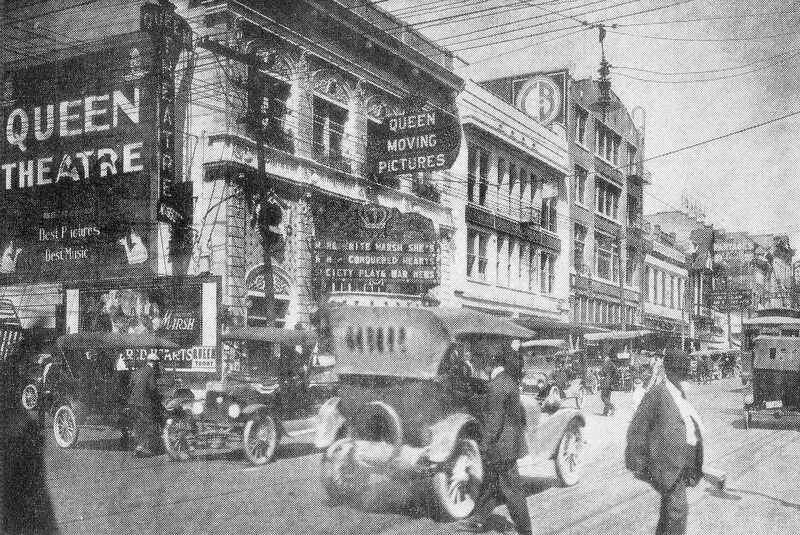 More info on the 1918 photo of Elm Street, which was featured in the post “Dallas’ Film Row — 1918,” here. More info on the super-sooty Pacific Avenue photo, here. More on the de-track-ified Pacific, here. Not sure of the source of the 1920 photo. Four of these photos are really big when clicked. One is not. For many years the T&P freight station survived on Pacfic at Griffin. 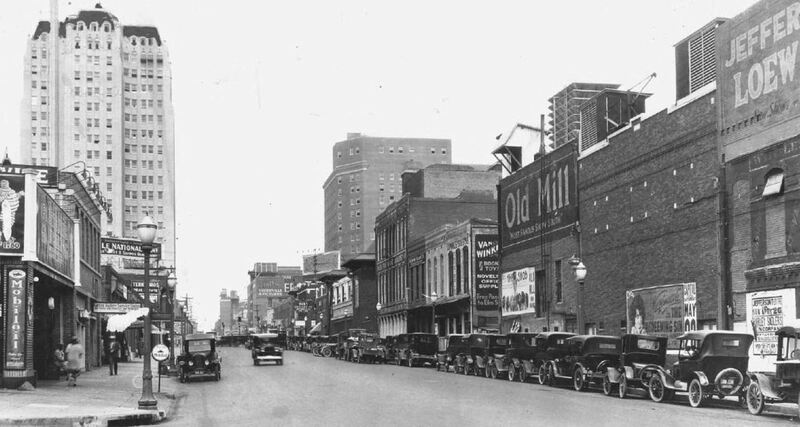 It was later torn down to become part of “Herald Square” in front of KRLD and beside the Times-Herald Building. Thanks for the info, Bob! Traveling shows took advantage of the Pacific Avenue right-of-way. Baggage cars could be spotted at the back of the Majestic Theatre and scenery and props could unloaded directly backstage. I’m probably not seeing the forest for the trees here, but does anyone else wonder what kind of a bicycle-like contraption the gent in the foreground of the first photo above is riding? You’re not alone, Bob! I was wondering the same thing! I should have googled a little longer before posting. His bike has a Smith Motor Wheel for auxiliary (non-human) propulsion. It’s an attachable wheel, complete with its own small gasoline engine, a brain wave of circa 1914. My comment has to do with the gorgeous Medical Arts Building in the left background of the photo from 1925 – oh how I wish that building were still here ! I have such fond memories of it when my mother worked in the Republic Tower next door in the 70’s and 80’s – when I was a kid I used to go downtown and sit at the ice cream counter in the pharmacy and the ladies all knew me and my favorite orders. The murals and art work in that Art Deco building were incredible. tracks are still under the asphalt on Pacific.. i saw them when they were repaving a while back! Interesting. The railroad track removal along Pacific was a major undertaking. I’ve seen photos from the 1920s of the tracks actually being removed. I wonder if what you saw might have been later tracks? Streetcar tracks maybe? i knew you would say that and i tried to remember what intersection i saw them….. darn it… i want to say around where 75 meets pacific … i knew i should have taken a pic!!! sorry!!! there they are.. right on live oak!! thanks Paula! I doubt there were streetcar tracks along Pacific Ave. where the T&P tracks were. They probably crossed Pacific Ave. but did not run parallel to the avenue. There was also a Texas Midland motorcar that operated over T&P tracks from Terrell to Dallas for some years. 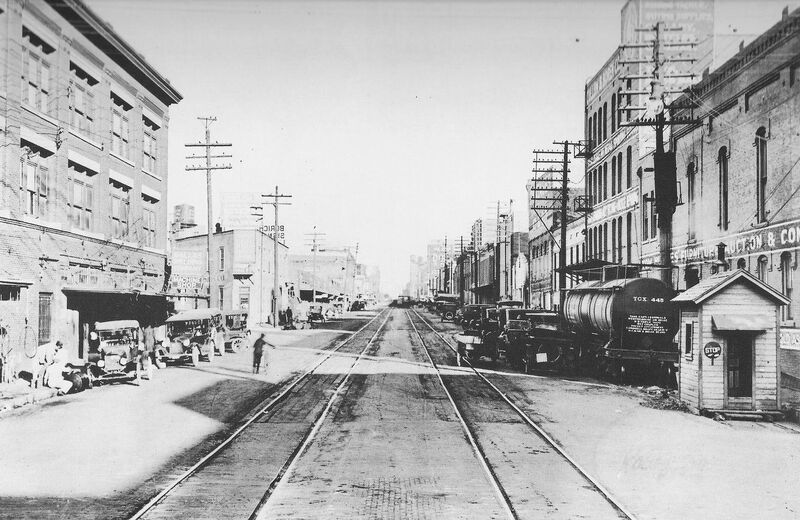 T&P had two freight depots–one near each end of the severed section downtown. I’ll have to look up the date when the work on pulling up tracks was officially started. It was a big deal! Thanks, Dennis. I think the track removal began in June, 1921. Yes, it was a HUGE deal! But it’s surprising that it seems to have taken more than two years to complete.